Three things are immediately obvious when one examines the biography of John Louis Esposito, American academic expert on Islam. The first is that -- as noted by his official biographical listing of more than forty-five books and monographs, along with his standing as editor of several reference series -- he seems indefatigably prolific, though the bulk of his writings present interpretations of contemporary phenomena rather than original research. The second is that he luxuriates in honors, including those bestowed by the kingdom of Saudi Arabia and other parties in whose objectivity about Islamic affairs few can believe. Finally, his work has provided an unremitting "explanation" that amounts to a committed defense of radical, rather than traditional, Islam. Esposito aspires to become the chief interlocutor between the U.S., if not the West as a whole, and the Muslim lands -- especially the extremist elements in Islamic societies. 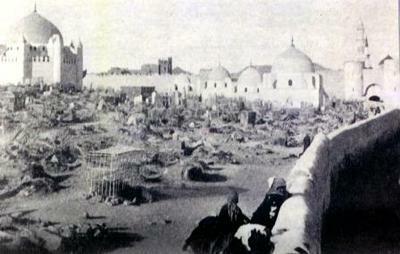 Jannat ul-Baqi, the cemetery in Medina of the Family, Companions, and Successors to the Prophet Muhammad sallallahualeyhisalaam, before its demolition by Saudi Wahhabis in 1925. 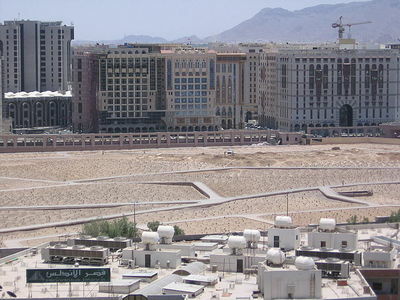 The devastated site of Jannat ul-Baqi, 2008 -- Photograph Via Wikimedia Commons. 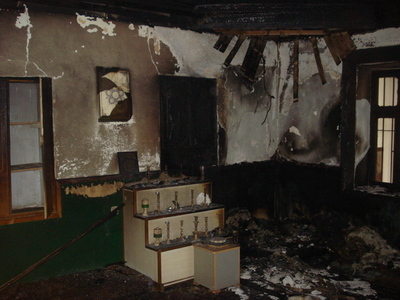 Wahhabi vandalism at the Baba Harabati Sufi shrine in Tetova, Macedonia, 2010 -- Photograph by the Bektashi Community of the Republic of Macedonia. In his career as an academic and public intellectual, Esposito has emphasized his conviction that Islamist ideology is a path to liberation of Muslim societies from oppression, and, like many other Middle East studies experts, he is quick to accuse critics of Muslim radicalism of Islamophobia. He has accumulated a further sheaf of statements that should be embarrassing to him, but apparently is not. Most offensively, he stood up for Sami Al-Arian, who pled guilty in 2006 to a charge of providing services to the Palestinian Islamic Jihad, a Specially Designated Terrorist Organization according to the U.S. government. At an August 18, 2007 fundraising event in Dallas for the Council on American-Islamic Relations (CAIR), a leading American Islamist group, Esposito declared, "Sami Al-Arian's a very good friend of mine." On the same occasion, he affirmed his solidarity with "the Holy Land Fund [sic, Holy Land Foundation], but also with CAIR." Five principal leaders of the Holy Land Foundation (HLF) and the organization itself were found guilty in 2008 on 108 charges of support for Hamas. The U.S. authorities had already added HLF to the roster of Specially Designated Terrorist Organizations in 2001, but in the view of Esposito, as recorded on National Public Radio on October 22, 1994, Hamas was "a community-focused group that engages in 'honey, cheese-making, and home-based clothing manufacture.'" On July 2, 2008, Esposito penned a lachrymose description, addressed to U.S. District Judge Leonie Brinkema, of Al-Arian as a "dedicated family man. ... Sami Al-Arian is a proud, dedicated and committed American as well as a proud and committed Palestinian. He is an extraordinarily bright, articulate scholar and intellectual-activist, a man of conscience with a strong commitment to peace and social justice." Esposito is University Professor as well as Professor of Religion and International Affairs and of Islamic Studies at Georgetown University. He is also the founding director of the Center for Muslim-Christian Understanding (CMCU) in Georgetown's Walsh School of Foreign Service, renamed the Prince Alwaleed Bin Talal Center for Muslim-Christian Understanding (ACMCU) in 2005, after twelve years in existence, upon the receipt of a $20-million gift from the Saudi prince. Bin Talal became known to Americans in the aftermath of the 9/11 attacks, when he attempted to hand a $10-million donation to then-mayor of New York Rudy Giuliani. The prince's check was accompanied by a declaration that "the government of the United States of America should re-examine its policies in the Middle East and adopt a more balanced stance towards the Palestinian cause." Giuliani returned the check and rejected Bin Talal's criticism. Four years later, Esposito evinced no such qualms. Partly educated in and long employed by Catholic institutions, Esposito received his B.A. in philosophy from St. Antony's College, at Oxford in the U.K., in 1963; his M.A. in theology from St. John's University in New York three years later; and his Ph.D. in Islamic Studies, with a minor in comparative religions, at Temple University (Philadelphia) in 1974. From 1975 to 1995 he taught at the College of the Holy Cross in Massachusetts, founded by members of the Society of Jesus (Jesuits), and in 1993, he began his career at Georgetown, another Jesuit institution, with a two-year overlap between the two schools. Aside from these credentials, Esposito has served as president of the Middle East Studies Association of North America (MESA) and of the American Council for the Study of Islamic Societies, and also as vice chair of the Center for the Study of Islam and Democracy (CSID). In such activities, Esposito's sympathy for radicalism thrives: MESA is rife with anti-American, anti-Israel, and pro-Islamist propaganda camouflaged as scholarship, while CSID is an open advocate for Islamist ideology. Esposito is also vice president (2011) and president-elect (2012) of the American Academy of Religion. Esposito's wanderings in Islamic affairs have led him along paths that appear distinct to an outsider, but which all end in the same place: advocacy for Islamist governance. His published works include the 2003 volume Turkish Islam and the Secular State: The Gülen Movement (Syracuse University Press), coauthored with M. Hakan Yavuz -- an enthusiastic depiction of the ideological movement directed by the leading Turkish Islamist Fethullah Gülen, presented in the volume as equivalent to "Turkish Islam" in general. This book was followed by a 2010 collection of encomia to Gülen, titled Islam and Peacebuilding: Gülen Movement Initiatives, co-edited with Ihsan Yilmaz and published by Bluedome Press, an apparent Gülenist enterprise. The Gülen movement comprises a major element in the political apparatus created by the Islamist Justice and Development Party, known by its Turkish acronym, the AKP; led by prime minister Recep Tayyip Erdoğan; and holding power in Turkey since 2002. Esposito has also collaborated with the Turkish academic Ibrahim Kalin, currently a visiting researcher at Georgetown, on a new book, Islamophobia and the Challenge of Pluralism in the 21st Century, published in March 2011 by Oxford University Press. Kalin, a senior adviser to Erdoğan, actively supports the AKP line that "Turkey is certain to increase its multi-leveled engagement policy in the Arab world." This for the Al-Jazeera broadcasting system in June 2011, following the third national electoral triumph for the AKP, which Kalin hailed as "a victory not only for Prime Minister Erdoğan but also for Turkish democracy." Esposito has also toiled in the ideological fields of the Islamic Republic of Iran, which awarded him its 1996 World Book Prize, although his C.V., which differs from his Georgetown biography, doesn't name the book. But his most notable service -- by far -- is to Saudi Arabia and its official Wahhabi interpretation of Islam. In his endeavors, Esposito has availed himself of three females he has mentored through careers in academia and public policy: Natana DeLong-Bas, Hadia Mubarak, and Dalia Mogahed. The activities of these scholars, whom Esposito has nurtured, offer further evidence of Esposito's radicalizing influence within Middle East studies. Georgetown graduate DeLong-Bas, who also taught at Brandeis, is now a part-time faculty member in the theology department at Boston College. In 2004 she wrote Wahhabi Islam: from Revival to Global Jihad, also published by Oxford, and produced, as she noted, with the encouragement of Esposito, with whom she had coauthored an edition of one his earlier tomes, Women in Muslim Family Law (Syracuse, 2002). Further, DeLong-Bas acknowledged the assistance of three prominent Saudis in writing her Wahhabi apologia: Prince Faisal Bin Salman, whose title she left unmentioned; Abdallah S. al-Uthaymin, son of a Wahhabi cleric; and Fahd as-Semmari, director of the King Abd Al-Aziz Foundation for Research and Archives, in Riyadh, for which she expressed thanks for financial support. Here the Esposito method was laid bare: thanks to his sponsorship, Saudi money subsidized a U.S. academic product intended to ameliorate the image of Wahhabism, the most extreme fundamentalist interpretation of Islam in modern times, and the inspirer of so-called "Salafi" radicals, from the Muslim Brotherhood through the South Asian jihadist movement founded by Abul Ala Mawdudi to al-Qaeda. In the mind of DeLong-Bas, Wahhabism could be considered, as noted in a review of the book, "peaceful, traditional, spiritual, and even feminist." DeLong-Bas outdid herself, however, in an interview with the Saudi-owned pan-Arab newspaper al-Sharq al-Awsat on December 21, 2006. Therein she denied that Wahhabism was extreme; that Muslim Brotherhood founder Hassan al-Banna and the movement's foremost ideologue, Sayyid Qutb, were jihadists; and, most incredibly, that there was evidence for the involvement of the then-living Osama bin Laden in the 9/11 attacks. Next among Esposito's prominent female disciples came Hadia Mubarak, a researcher at CMCU, who arrived there via a post as national president of the Muslim Students Association (MSA) of the U.S. and Canada and as a board member of CAIR, two leading components of the "Wahhabi lobby" in the U.S. She had received her B.A. from Florida State University and was accepted at Georgetown for graduate work. There she became inveigled in an unsuccessful but nonetheless disreputable effort to transfer $325,000 to ACMCU from the Organization for the Islamic Conference (OIC), a fifty-seven-member international body created in 1969 to "protect" the Muslim holy sites in Jerusalem from Israel. Mubarak then went to work for the Gallup Poll's Muslim World Project. Similar arguments have been made before; some of this is true, some is rubbish, much is irrelevant[.] ... The question often revolves around a disputed data point: Of the world's 1.3 billion Muslims, how many are radicals? ... The book draws on a mammoth, six-year effort to poll and interview tens of thousands of Muslims in more than 35 countries with Muslim majorities or substantial minorities[.] ... The answer to that all-important question, the authors say, is 7 percent[.] ... The not-so-hidden purpose of this book is to blur any difference between average Muslims around the world and average Americans, and the authors rise to the occasion at every turn. Satloff noted that at a WINEP event hosted for Mogahed, she admitted that "[t]he book is a book about the modern Muslim world that used its polling to inform its analysis. So that's important: It's meant for a general audience, and it's not meant to be a polling report." Mogahed is also known for her lighthearted treatment of Islamic law as protective of women, among other adventures in the company of extremists. It is an article of faith to many policy makers...that Hamas, Hezbollah, and the Muslim Brotherhood are terrorist groups who should be denied any role in political discussions or civil society. Esposito -- while condemning suicide bombings and attacks on civilians as 'immoral' -- says these groups cannot be written off. Policymakers must move beyond policies that equated protection of national interests with the stability and security of regimes and were driven more by fear of the unknown than support for Western principles of self-determination, democracy and human rights. Old habits die hard[.] ... Clinging to a failed narrative and the threat of a hostile Islamist takeover, risks succumbing to the temptation to 'encourage' or influence a specific outcome in Arab elections which will validate the concerns of Egyptians and others in the Arab world. That's the real Esposito, even if somewhat watered down: discounting the threat of radical Islam even as it makes a flamboyant entry, particularly in the Egyptian Revolution. Yes, indeed, old habits do die hard. On that point, there can be no disagreement with John Louis Esposito.